April 15, 2019 By Allyson 13 Comments This post may contain affiliate links. Read my disclosure policy. 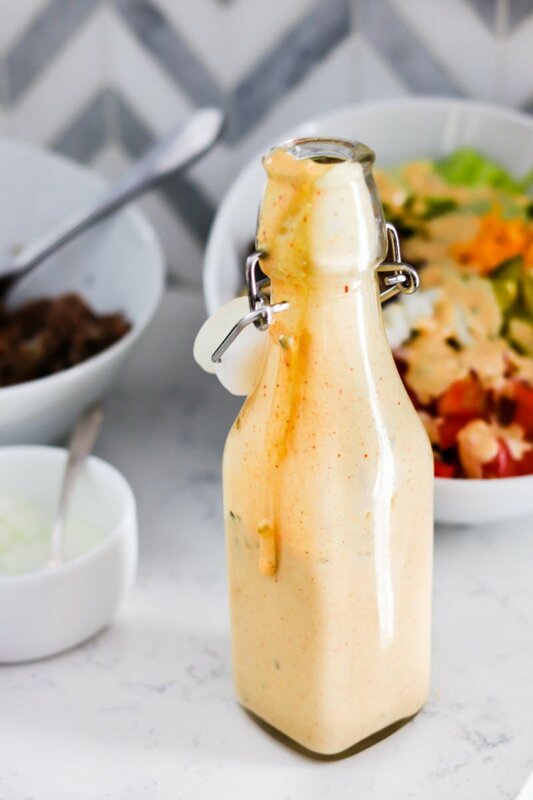 Big Mac Sauce is perfect on burgers, fries, and salads! With just a handful of basic ingredients, it’s simple and delicious! 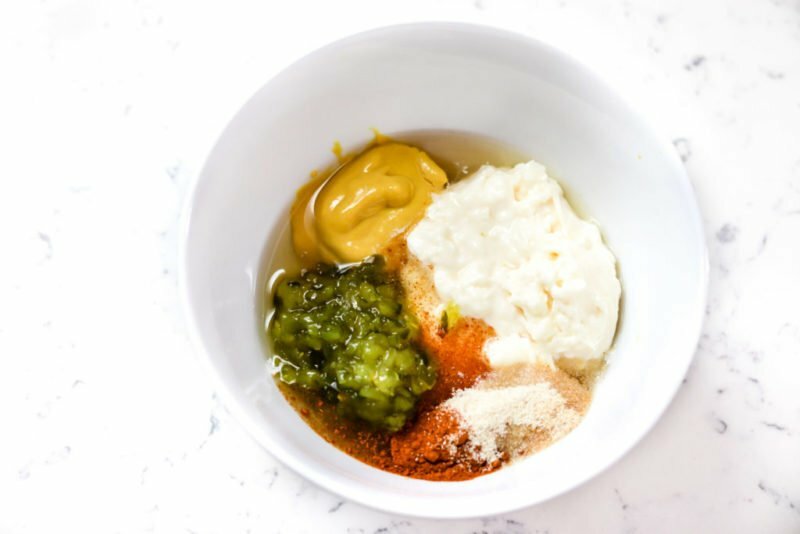 Big Mac Sauce is one of the reasons people buy the big mac, but little did you know, it’s so easy to make it! Most of the ingredients are probably already in your fridge and pantry! 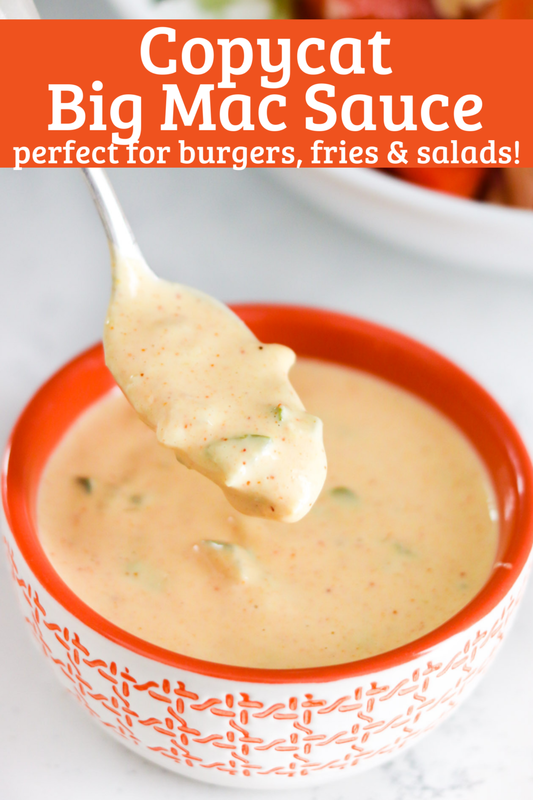 This Copycat Big Mac Sauce is delicious on burgers, fries, salads, or whatever you want! Whip up a batch and keep it in the fridge to use as needed! I love trying copycat sauces such as the delicious ZAX SAUCE or Outback Bloomin’ Onion Sauce! Making Big Mac Sauce is so easy and it only contains a few ingredients. If you look at the ingredient list from McDonalds, there will be tons of ingredients (33 to be exact) that you won’t recognize like, ‘Spice Extractives, Polysorbate 80, Propylene Glycol Alginate, Sodium Benzoate (Preservative), and Vegetable Protein,’ just to name a few. What are these things?!??! I love to know what’s actually in the food I’m eating, so figuring out how to make Big Mac Sauce without all the scary ingredients was a must for me, and not too difficult. I tried various recipes I found online, but nothing seemed quite right. After tweaking things multiple times, I found the best copycat big mac sauce recipe! Add mayonnaise, relish, mustard, apple cider vinegar, and seasonings. Whisk to combine well. Place covered in the fridge for at least an hour to let the flavors meld. Serve as desired, shaking/stirring before using, and store covered in the fridge for up to 2 weeks. Shake or stir before using. Using this Copycat Big Mac Sauce is a non-issue! It’s delicious on EVERYTHING! If you like dipping french fries, sweet potato fries, or onion rings in sauce, this is perfect. Using Big Mac Sauce with Air Fryer Asparagus Fries is also a winning combination! Baked Avocado Fries are also a delicious option for this sauce! 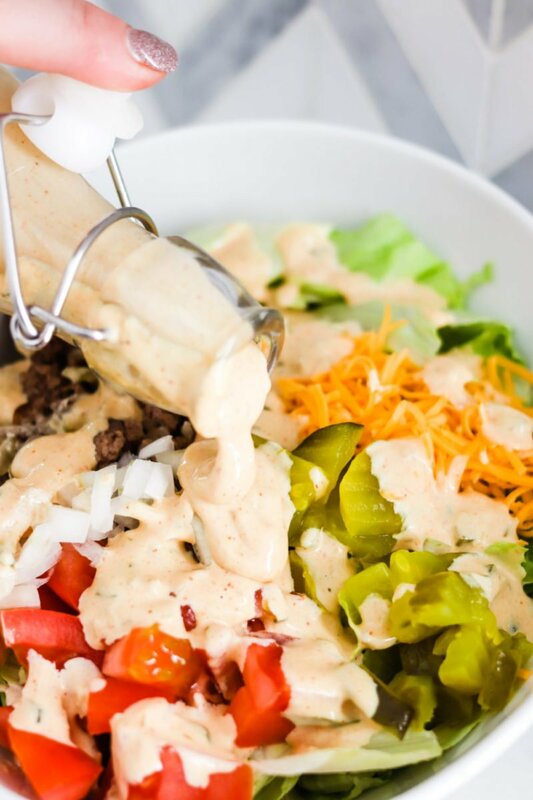 Serve Big Mac Sauce over a salad as a delicious dressing. If you want the sauce a little thinner, just add a splash of milk or rice vinegar to the dressing. The obvious answer here is A BURGER! Whip up some homemade beef or veggie burgers and drizzle the big mac sauce over the top- YUM! Zaxby’s Sauce is perfect dip for chicken or french fries . With only a handful of ingredients, it’s super easy to make and majorly addicting! Copycat Outback Bloom Sauce is perfect for Outback Bloomin Onion Petals or onion rings! 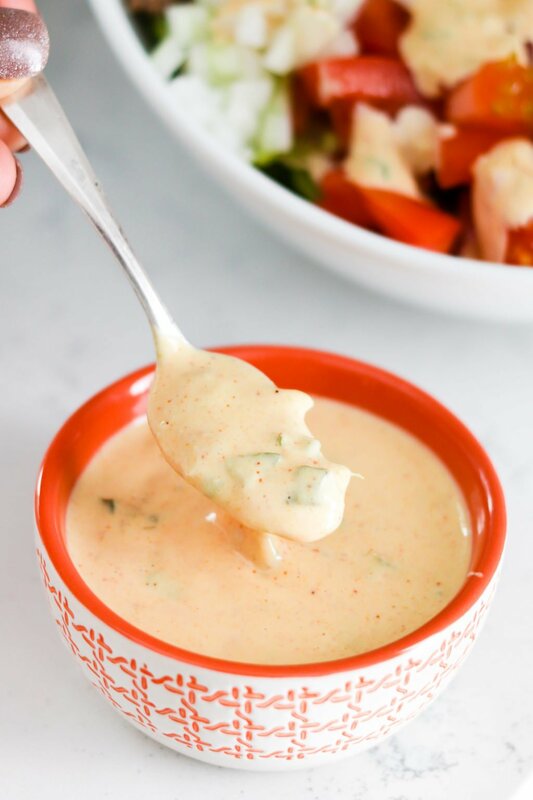 Jalapeno Ranch is an easy dip/dressing that is tasty on everything! Use it on salads, dip fries and onion rings in it, or use it on my favorite- pizza! Cilantro Lime dip is delicious for chips, enchiladas, tacos- you name it! Big Mac Sauce is perfect on burgers, fries, and salads! With just a handful of basic ingredients, it's simple and delicious! Add mayonnaise, relish, mustard, apple cider vinegar, BBQ sauce, and seasonings. Whisk to combine well. Serve as desired, shaking/stirring before using. Store covered in the fridge for up to 2 weeks. Shake or stir before using. 49 calories, 3g fat, 6g carbohydrates, 5g sugar, 0g protein. We love this! Put it on everything! Tasted SPOT ON. So yummy. Summer grilling just got better! Going to be putting this on everything. Love adding sauce to burgers! It gives them such a nice, yummy bonus! Love that it requires ingredients I usually have on hand, too! I don’t eat many Big Mac’s, but I do love them! I’m excited to make this sauce at home and add it to my own homemade burgers! Thanks for the recipe!! Tasted just like the real thing! 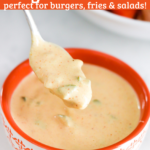 Ohh… I always love a good burger sauce! wow! I was looking for this sauce. I am so glad to make it at home! Amazing sauce recipe! We love to use this sauce for anything! Never liked Big Mac’s. But did like the sauce…lol now I can make it for on whatever I want. I love when you can have a homemade sauce at home! This tastes just like the original from the golden arches. After working there for many years in college. I know what’s good and what’s bad. You have nailed it!